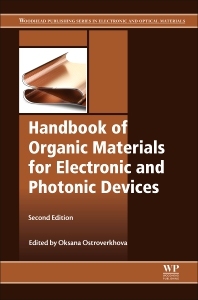 Handbook of Organic Materials for Electronic and Photonic Devices, Second Edition, provides an overview of the materials, mechanisms, characterization techniques, structure-property relationships, and most promising applications of organic materials. This new release includes new content on emerging organic materials, expanded content on the basic physics behind electronic properties, and new chapters on organic photonics. As advances in organic materials design, fabrication, and processing that enabled charge unprecedented carrier mobilities and power conversion efficiencies have made dramatic advances since the first edition, this latest release presents a necessary understanding of the underlying physics that enabled novel material design and improved organic device design. Oksana Ostroverkhova is Professor in Physics at the Department of Physics, Oregon State University, USA.